The 2018 midterms were historic. Early estimates show that more than 48 percent of eligible voters cast a ballot in the election–that’s over 113 million people that voted on Tuesday. This is the highest turnout for a midterm since 1966! While midterms may not seem like the sexiest of elections, the effect they have on issues, especially the ocean-related issues that we care about, is enormous. Congressional representation is the first line of defense for our coasts, and their voice in Washington represents ours. With a Trump-led administration that is increasingly hostile towards in the environment, we knew that electing ocean-minded politicians had to be our number one goal in 2018–matched only by our efforts to get the surfing and ocean community excited about voting. Whatever our connection to the water is, from surfing to kayaking to beach walks, we are the only voice the ocean has. If we want to protect our coasts and waters from oil spills, plastic pollutants, and overfishing, then we have to say so. And in government, the best way to get something done is to elect officials that will fight for you–not against you. All that being said, the environment and the ocean had some momentous wins on Tuesday. In many coastal districts, we have gained new leadership that have pledged to focus on innovation in renewable energy, while taking a stand against corporate greed to keep our waters and coastlines clean, accessible and healthy. Together, we worked to institute a Democratic House of Representatives, and support representation that will protect coastal districts and promote environmental protections. All of our key ocean races were won! While not everything around the country went the way we had hoped, we won the races we set out to win. When we started this journey in January 2018, we had four races across the country that we prioritized. Three out of four of them had climate-deniers in office that we were determined to oust, along with a retiring congressman in CA49 that needed to be replaced with a candidate that prioritized protecting their coastal districts. We knew an ocean-minded message could actually help flip these historically conservative districts. In addition to these races, we fought hard for Beto O’Rourke in Texas, and Jessica Morse in CA-04, running digital campaigns targeting surfers and snowboarders, respectively. This tight race in coastal Orange County is where we focused most of our energy. We began fighting for Harley as the primaries approached. With the help of locals on the ground, we sent out a mailer that helped avoid a Republican lockout, and helped Harley win by 123 votes. If it weren’t for that mailer, coordinated efforts between Blue Uprising & Indivisible OC 48, along with countless volunteers knocking on doors, electing Harley on Tuesday would not have happened. Harley Rouda now leads the ballot count with 8,510 votes. Taking on 30-year incumbent Dana Rohrabacher in a district that has historically voted Republican, Rouda’s stance on climate change, along with his promise to make the district a profitable hub of renewable energy and coastal protections, made our endorsement obvious. After Rouda won the primary, we continued our push to elect ocean-friendly Rouda through a grassroots fundraising campaign. This small-donor funded campaign made it possible for us to send out our most important campaign in OC: a letter to coastal Independents and Moderates from the first president of the Surfrider foundation. The letter recounted past oil spills in Huntington Beach, along with a plea to come together and elect a candidate who does not support offshore drilling. Along with our voter engagement rallies, and a strong digital campaign, Rouda has come out ahead in a race that is surprising the nation. We can’t begin to tell you how excited we are about Mike Levin’s success in San Diego! In CA-49, when Rep. Darrell Issa retired, the competitive fight for his seat between Mike Levin (D) and Diane Harkey began. Levin’s background as an environmental attorney, along with his strong focus on clean energy and environmental protections, make him a boon to San Diego’s coastal economy and a friend to ocean lovers throughout the district and state. Our CA-49 campaign consisted of digital ads that we ran targeting constituents of CA-49. We also engaged influencers and community members, holding our final and most engaged I Surf. I Vote. rally in Carlsbad, CA. Florida is ground zero for climate change. As increasingly powerful storms, red tides, flooding, and coral bleaching continue to batter the Sunshine State, we know that electing environmentally-minded representation is the only way to protect residents, especially the underserved and/or impoverished. Florida’s 26th district is home to all 3 of Florida’s national parks, along with Key West, Biscayne Bay and other places distinctly affected by climate change. We supported Debbie Mucarsel-Powell (D) because of her clear, strong commitment to addressing climate change and the effect it has on residents, marine life and coastal economies. Mucarsel-Powell’s work with the Coral Restoration Foundation to slow the impacts of climate change on marine life and coral reef systems is the kind of work we need elected officials in Florida to care about. 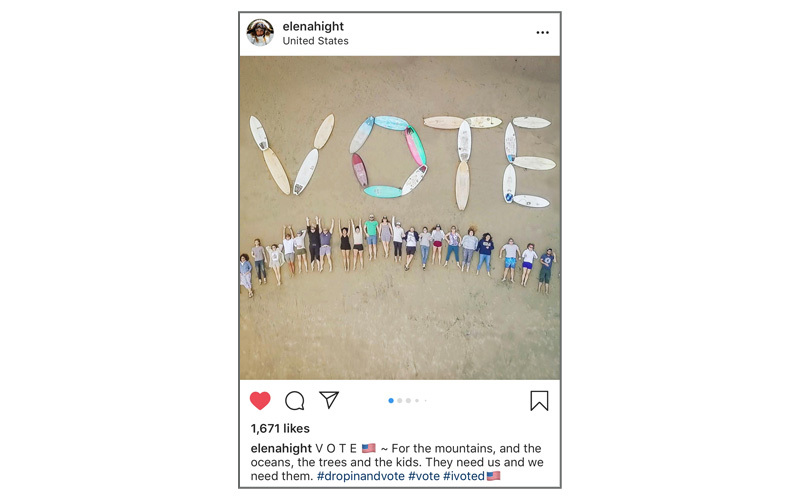 Our digital campaigns ran statewide, and focused on coastal voter engagement. Mucarsel-Powell won a very tight race, and Florida is lucky to have her! Supporting Elaine Luria (D) for VA-02 was a no-brainer for us. With incumbent Scott Taylor’s beyond disappointing track record of voting against any and all pro-environment legislation, Virginia Beach was in desperate need of a candidate that understands the needs of rural voters, coastal voters and everyone in between. Luria’s experience as local small business owner and Navy Veteran make her uniquely qualified to lead in Virginia Beach. Her defense of clean water and air initiatives, along with her opposition to offshore drilling made her a shining light in coastal Virginia. Our support in VA-02 included hosting an I Surf. I Vote. rally in Virginia Beach, along with running digital campaigns in support of the candidate. We are proud to say that Elaine Luria won in Virginia Beach by a small, and well-earned, margin. Our work has only just begun. We are strategizing how to best support sustainable, ocean-minded legislation and candidates in 2019 and 2020. Stay tuned!